I’d chosen Stavanger because I wanted a fairly large city I had yet to visit (Stavanger is the fourth largest city in Norway), and one that permitted an easy connecting flight from Oslo Torp (Ryanair still had regular Milan-Oslo flights to Torp back in 2013). Trondheim was also top list, but it was a bit further up north, and it would probably have taken longer to get there. 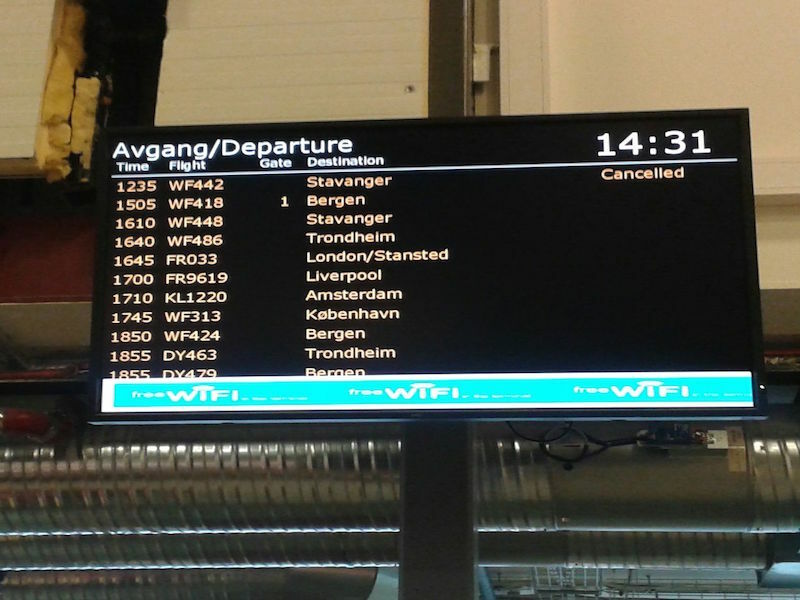 When I arrived at Torp airport I found out that my domestic flight had a one-hour delay. Okay, fair enough, I’ve got time to kill. Then suddenly the flight had a two-hour delay. Ok know what? I’m going to watch a film. Then suddenly it was cancelled. First mild surge of panic. What happens now? Not knowing what to do, I automatically did what other people were doing, i.e. queue up at the airline front desk. I was a bit lost. Bloody hell, I’m going to be stuck here for the whole day, no wait, I’m going to spend the night here, and tomorrow, what happens tomorrow? And I’m only staying for a few days, so I might just go back home. I collected the free plane tickets the airline assistant handed over, and left the desk. I sat in a corner, tickets still in hand, and ponder. I gave my friend Bobby back in Italy a quick call to let her know I was temporarily stuck at Torp, then, again, pondered. Then it hit me. ‘Going home? Never going to happen. I’m so flying to Copenhagen, then I’m off to Stavanger from there, and who cares if I’ve lost the whole day. Plus, who says it’s lost? I’m kind of growing to like this jumping off a plane and on to another. Plus, I’m still going to Stavanger, so yay’. I landed in Stavanger around 11.20pm. By the time the bus dropped me at the hostel it was past midnight. I should have been here six hours ago, I said to myself. Oh well, just go get a good night’s sleep. This entry was posted in Norway, Norway 2013 and tagged airport, copenhagen airport, flight, flight delay, norway, norway 2013, stavanger by Giorgia. Bookmark the permalink.